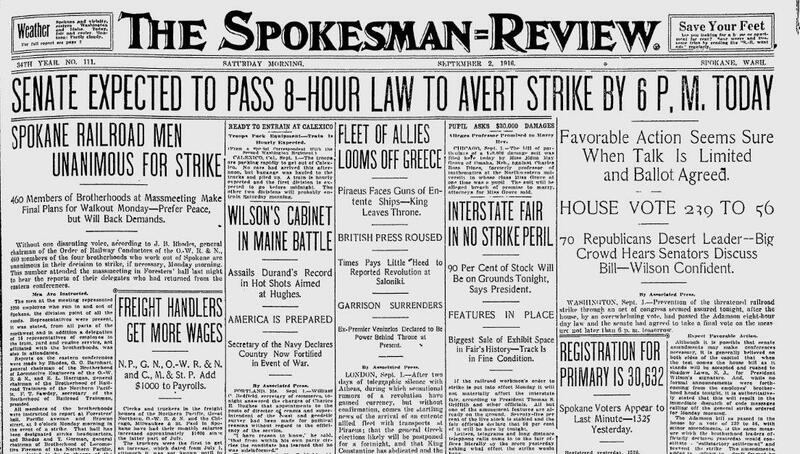 The 460 Spokane members of four railroad unions voted – “without one dissenting voice” – to go on strike beginning several days hence. It was part of a nationwide call for a strike over the issue of an eight-hour day. The four main railroad unions – the “brotherhoods” of railroad trainmen, locomotive engineers, railway conductors and locomotive firemen – were united in their call for a strike. The prospect of a strike was especially frightening to the region’s farmers and orchardists, who relied on the rails to get their harvests to market. It was even causing some concern at Spokane’s Interstate Fair, scheduled to open soon, although the president of the fair committee said most of the “amusement features” and livestock were already on the grounds. The latter was now a distinct possibility. The U.S. House overwhelmingly passed an eight-hour day law, and the U.S. Senate was set to act on it before the strike deadline. If the law passed, there were indications that the unions would call off the strike. From the game beat: About 50 spectators crowded around to watch a “hotly contested semifinal” game – of checkers. A group of “old-time checker fans” watched G.E. Booth and H.F. Anderson earn spots in the Spokane Interstate Fair Checkers Tournament, to be held in a week.